Six Degrees of Francis Bacon — the interactive online tool that allows anyone to trace the personal relationships among figures like Bacon, William Shakespeare, Isaac Newton and many others — has received a coveted National Endowment for the Humanities (NEH) grant. The $325,000 Digital Humanities Award, one of 300 new grants announced, will allow the Carnegie Mellon University and Georgetown University team to continue reconstructing Britain’s early modern social network, improve the user experience, connect the project with other digital resources and work to permanently curate, maintain and preserve it. Because of limited humanities funding opportunities, the NEH awards are extremely competitive. "NEH grants help bring humanities experiences to Americans across the country," said NEH Chairman William D. Adams. "We need the humanities, now more than ever, because they give us access to the most fundamental and consequential dimensions and forces of our experience." 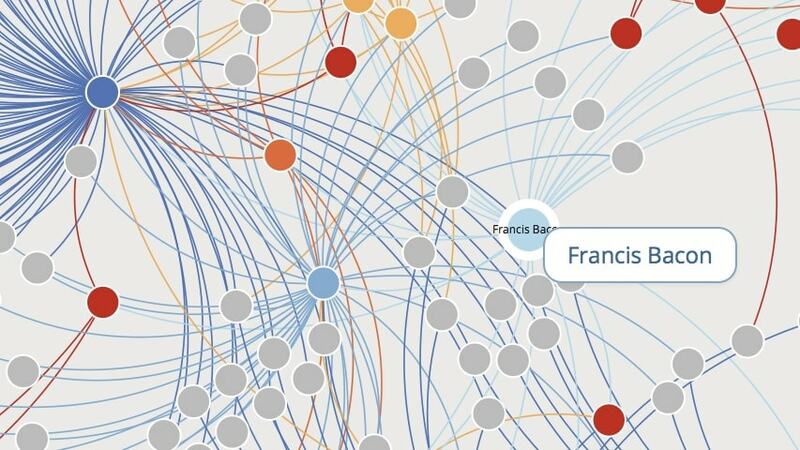 Six Degrees of Francis Bacon identifies more than 15,000 individuals, highlights approximately 200,000 relationships and lets users view and add to the network. Since its launch in October 2015, the website has received more than 40,000 visits. It is an example of how digital humanists can use computers and technology to answer long-sought-after questions and explore fields like literature and history in new ways. It is unique because it encourages professional researchers, students and amateurs to participate in the same community. And, at a basic level, it can give anyone an immediate sense of historical networks and communities and help them develop more sophisticated interpretations. To create Six Degrees of Francis Bacon, Carnegie Mellon’s Christopher Warren, Georgetown’s Daniel Shore and CMU’s Jessica Otis mined the 62 million words in the Oxford Dictionary of National Biography to map who knew whom between 1500 and 1700. They relied on CMU’s Department of Statistics and specifically the data mining expertise of Associate Professor Cosma Shalizi and Ph.D. student Lawrence Wang to develop the visual social network. The team collaborated with CMU’s Raja Sooriamurthi, teaching professor of information systems, and his undergraduate students to allow users to add research and knowledge. "Chris Warren’s work is wonderful and deserves to be supported by the NEH," said Richard Scheines, dean of Carnegie Mellon’s Dietrich College of Humanities and Social Sciences. "Warren’s work is solidly grounded in the humanities, but he has embraced the 'digital' tools becoming available to amplify his own scholarship and to create a community of scholars in the humanities, all of whom will benefit from these tools." Understanding interactions from this period has numerous uses, including helping experts keep track of the many associations and giving newcomers contextual information about relationships that are often difficult to access. "If you are studying mathematician Isaac Newton and want to find out if he knew the poet John Milton or if you’re studying Quaker William Penn and want to know if he knew the philosopher John Locke, you can see those things in an instant," said Warren, director of the project and associate professor of English in the Dietrich College. "Our vision for 'Six Degrees' is humanistic inquiry that’s at once more public and participatory than prior generations, and also more accurate, useful and interconnected." Six Degrees of Francis Bacon has been used in classrooms at Carnegie Mellon and Georgetown in various ways. Students used the network to understand how early modern people were related, and they also added information to the network based on their own research in the period. The team hopes that more classes take advantage of the tools and information the site offers. "'Six Degrees' is a terrific tool for use in the classroom," said Shore, associate professor of English at Georgetown. "Not only does it introduce students to the people of 16th- and 17th-century Britain in an intuitive way, it also shows them that they can make real contributions to knowledge based on their own research. By spending time with period documents, students quickly gain the expertise to add and describe complex relations between people, enriching our collective understanding of how early modern society was put together." The NEH, which is celebrating its 50th anniversary, is an independent federal agency that supports the best in humanities research, public programs, education and preservation projects. Video: What is Six Degrees of Francis Bacon?